Our practice group has been sounding the alarm regarding wage and hour issues – specifically highlighting “industry practices” and bonus plans. The Fair Labor Standards Act (FLSA) and its attendant regulations are often an area of serious confusion for employers. Additionally, when employers in the same industry compare notes and feel comforted that “everyone” is using the same pay practice – this is often something that acts as a “red flag” to us as practitioners. We recently received confirmation about our concerns on these issues. Director Sherrill further noted that the DOL targets industries for enforcement where enforcement data shows there is a higher likelihood of FLSA violations. (Director Sherrill’s testimony: http://edworkforce.house.gov/uploadedfiles/sherrill_testimony.pdf). The testimony at the hearing also included information about the aggressiveness in enforcement by the Wage and Hour Division of the Department of Labor (WHD) with regard to bonuses and the failure by employers to pay additional overtime on the increased “regular rate” due to the payment of a bonus. Additionally, it was noted that “WHD will challenge almost any bonus as non-discretionary,” therefore any reliance an employer may have on the discretionary bonus language contained in the regulations will likely be misplaced. (DeCamp testimony, http://edworkforce.house.gov/uploadedfiles/decamp_testimony.pdf). What this means for Iowa employers – Employers should ensure that workers are characterized correctly: employee v. independent contractor; exempt v. non-exempt. Also, all hours of work need to be recorded and paid at the right rate. Further, bonus programs should be reviewed to determine whether bonus payments increase the regular rate (thereby increasing the amount of overtime due). In addition to making sure all these items are being handled correctly “in practice,” written policies notifying employees of the need to record all time worked and encouraging employees to identify and report mistakes or other pay issues can provide valuable information to the employer to correct problems, as well as legal defenses. 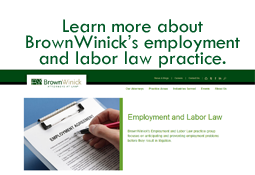 If you have questions about employment policies and practices regarding wage and hour issues, you should contact your BrownWinick employment law attorney.